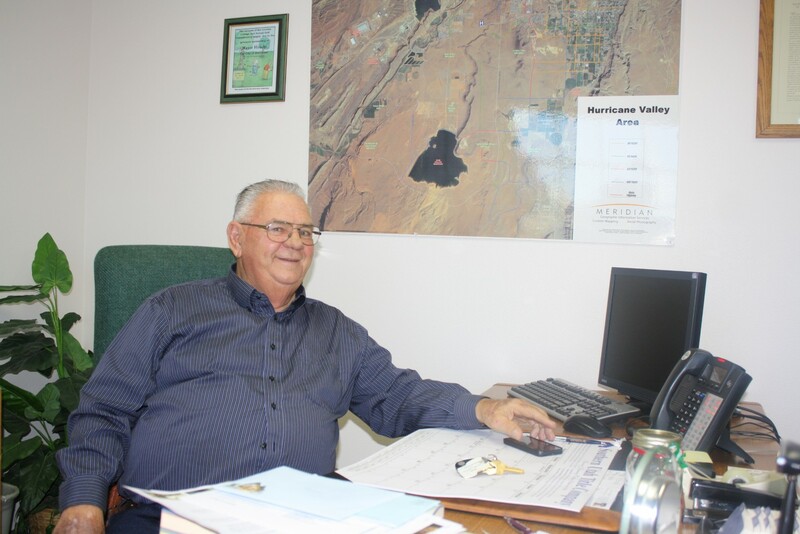 HURRICANE – “I love Hurricane,” Mayor Tom Hirschi will tell anyone who asks him what inspired him to become the city’s mayor. City Councilmen Kevin Tervort and Mike Jensen said that the city should stick him at the entrance to the community as its greeter. “He can’t stop bragging about Hurricane everywhere he goes, “Jensen said, explaining, with a bit of hyperbole, that it takes the mayor 10 hours to get to Salt Lake City because he tells people about the town at every stop along the way. Tom Hirschi’s youngest son, Matt Hirschi, said that his father is very friendly – another reason he is the mayor. He will strike up a conversation with anyone anywhere he goes, Matt Hirschi said, and when he does, he usually tells them about Hurricane. His love for the city and its people has translated into three terms as mayor, the only mayor to serve that long. At the city’s helm since 2002, he said he always had the philosophy that he did not want to be a lifetime politician. He feels like the city needs a change and he needs a change as well. “This is a good time to hit the road,” Tom Hirschi said. Tom Hirschi has been in public service for over 40 years. Next to father, Matt Hirschi said, the thing he thinks about his father’s identity is public servant. It all started when the elder Hirschi became a little league coach at the age of 17. He has also served as president of the city’s little league organization as well as a member of the city’s planning commission for nine years (three years as chair), the power board for three years and the city council for two years immediately before winning his first mayoral election. He also drove a school bus for 31 years. “He’s very unselfish with his time,” Matt Hirschi said. For instance, Matt Hirschi was still in high school when his dad served on the City Council and first served as mayor, and his father made it a point to rush from City Council meetings to watch him wrestle. 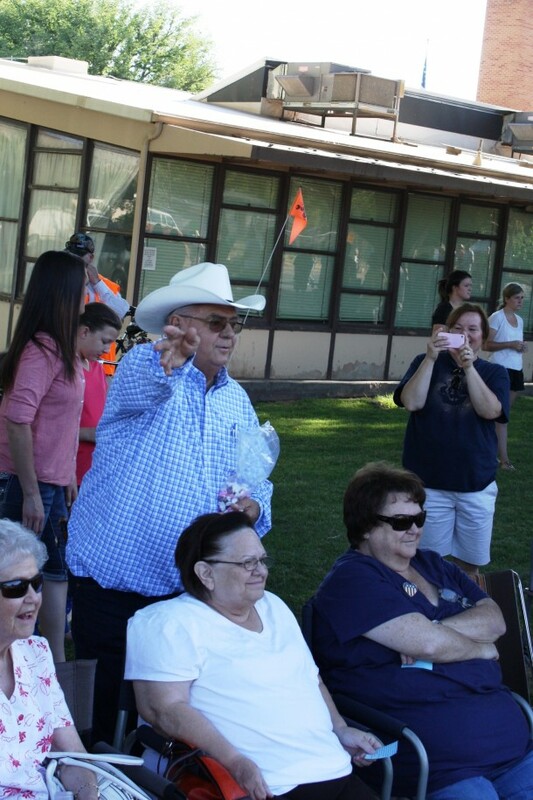 Despite his busy schedule, Mayor Hirschi also was a regular at his son’s other sporting events. “He made sure we had a couple of nights together,” Matt Hirschi said. Thankfully, Tom Hirschi said that during his tenure the city has never had to reduce force because of budget cuts. Instead it was mostly done by attrition. If someone quit, his or her position was simply not filled. While mayor, Tom Hirschi strived to be accessible to the public, saying it shouldn’t take people days to get to the decision makers. “The people deserve that,” he said. He said city residents came to his barbershop, Tom’s Clip Joint, to “cuss me out” and he welcomed it. “I haven’t been afraid to take the arrows,” he said. He also is not afraid to voice his opinion, City Councilwoman Pam Humphries said, explaining that sometimes everyone did not agree with him. “If he thinks it’s a good idea, he’ll tell you,” she said. As he leaves, one thing Tom Hirschi said residents could improve upon is taking more of an active role in their community. For instance, he said, when the council has passed the city budgets there have been very few in the audience but when there have been zoning changes in the city’s south fields, the council chambers have been full. Tom Hirschi listed many highlights of his 12 years as the city’s chief executive. The first he mentioned was the development of the city’s ATV trails which led to the inception of the Tri-State ATV Jamboree (held every March) in 2004. He also talked about attracting companies like Orgill to the Gateway Industrial Park. His crowning achievement, he feels, and the City Council members and his son agree, was the acquisition of the old elementary building and the auditorium across the street from it, which have turned into the city’s community center and has led to the ramping up of the city’s recreation program. He said that he and the council were ridiculed by some for purchasing the building but that many acquiesced later on saying they were wrong. Without Tom Hirschi, City Councilwoman Pam Humphries said, the city would not have pushed so hard to acquire what is now the community center. The mayor also listed the State Street improvements as another highlight of his tenure. “A lot of tourists tell us we have a beautiful town,” he said. Things he would like to see moving forward are more sidewalks and a softball complex. He said he hopes the city continues to provide a rural atmosphere with a thriving economy. In addition to stepping down as mayor, Tom Hirschi said he will also give up his seat on the Washington County Water Conservancy District Board. He said he has learned a lot by serving on the board, especially the importance of water for Washington County. In his mind, he said the county has two choices when it comes to water – build the Lake Powell Pipeline or stop building altogether. The pipeline will be expensive, but the county will only have to buy what it uses, he said. He is completely stepping out of the public spotlight because he and his wife, Kitty, would like to serve a mission for the Church of Jesus Christ of Latter-day Saints in the very near future. He said his preference would be to go to Nauvoo, Ill., so he could drive a team of horses. He is not worried about his departure, saying the city will be in good hands with John Bramall as mayor. He will miss his associations with the City Council and city employees who he said “work like heck to make Hurricane great.” The council and employees feel the same about him. “He’ll be sorely missed,” Humphries said. As to what his legacy will be, Hirschi said he’s never thought about it. Well Tom, you’ve had a “good run!” I am sorry to see you go, and yet you certainly have earned the right to have some time to do what you want! Of course, I somehow think that you have been pretty much doing what you want, which is serving the citizens of Hurricane! Good luck and go with God! You are an amazing person, Tom Hirschi and I am grateful for the years I’ve known you. Thank you for taking care of my kids. They hated riding the bus after you retired. Thanx for your service Tom. Enjoy your life as a private citizen. You were friendly to me. Probably the only mayor i ever met. I volunteered at the community center. Making the elementry school into a place where people could gather and share and learn from eachother was perhaps one your finer accomplshments. Thanks for your service. Good Luck Tom Enjoy Your Mission Keep In Touch God Bless On A Great Job Well Done !